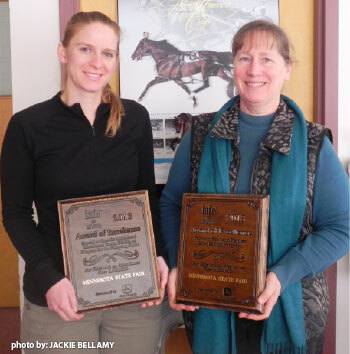 Guelph, Ontario – The International Association of Fairs and Expositions (IAFE) awarded the Equine Guelph/Minnesota State Fair partnership with two prestigious Awards of Excellence at the IAFE Annual Convention in Las Vegas in December, 2013. Award categories included ‘Fair and Sponsor/Partner Joint Exhibit Program’ and ‘Special or Specific Agricultural Educational Event, Exhibit, or Program for the Fairgoing Public’ for fairs with an attendance of over 1,000,000. “Agriculture and education are at the very heart of the Minnesota State Fair,” says Michelle Butler, agriculture education manager of the Minnesota Fair. “The Awards of Excellence recognize our continued commitment of our fairs roots while educating an increasing urban audience. The EquiMania! display captivated a multitude of horse-lovers with its engaging activities. We look forward to presenting it at our next fair August 21 – September 1 in 2014,” adds Butler. EquiMania!, Equine Guelph’s 5,000lb horse education display for youth, debuted at the Minnesota State Fair in August, 2013. The Canadian exhibit traveled over 500 miles for its five-year run in Minnesota – the second largest fair in the U.S. Produced by Equine Guelph from the University of Guelph, EquiMania! is an interactive youth education program and exhibition designed to teach kids about horse health and safety. Last year, the two partners joined forces to replicate the original EquiMania! exhibit for the Minnesota State Fair. “We were absolutely thrilled to work with the Minnesota State Fair to replicate our original EquiMania! exhibit,” says Gayle Ecker, director of Equine Guelph. “It will be great to share the fun, interactive display with youth as well as introduce our online education program to adults in the coming years." EquiMania! is available for other events in North America. Contact eq4kids@uoguelph.ca for more information.